The Hun School of Princeton is exhibiting more than thirty photos of Afghanistan by world-famous photographer Steve McCurry until June 12th in the Wilf Family Global Commons. Afghanistan Revealed: Photographs by Steve McCurry, includes one of the most recognized images in the world, Afghan Girl. 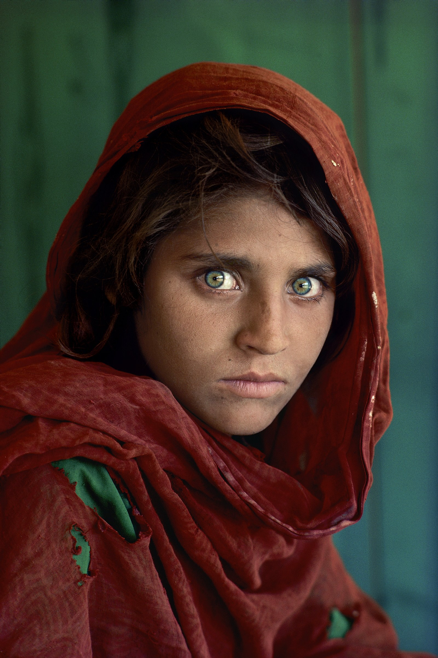 The photo, of a girl with striking green eyes and a red head scarf, was on the cover of National Geographic in 1985 during the Soviet-Afghan War. The exhibit is part of The Hun School’s Global Engagement program, which seeks to develop, through experiences in and out of the classroom, culturally proficient students who celebrate diversity and become globally engaged citizens. Mr. McCurry (see his website here) has spent 35 years photographing Afghanistan. Just before the Soviet invasion in 1979, he dressed as an Afghan to enter the country and left the country with rolls of film sewn into his robes. His work there won him the Robert Capa Gold Medal for Best Photographic Reporting from Abroad, an award for photographers exhibiting exceptional courage and enterprise. Mr. McCurry has put a human face on conflict across the globe, from Cambodia to Kuwait. His work has appeared in Time, Vanity Fair, The New York Times, Paris Match, and many other books and magazines. Afghan Girl, Sharbat Gula, 1984, is one of more than thirty photographs that make up Afghanistan Revealed: Photographs by Steve McCurry, on exhibit at The Hun School of Princeton’s Wilf Family Global Commons, March 25th through June 12th.